Rivertrack Studios Australian designs are unique, and inspired by the surrounding environment. We use recycled materials where possible. Jeweller, Dee Craig has an acute eye for detail and hours of work go into each unique piece. When you buy from Rivertrack Studios, you own a work of art. Dee has a Bachelor of Arts Degree in Visual Arts and Applied Design. She loves to work with silver, titanium, wood and semi-precious stones. 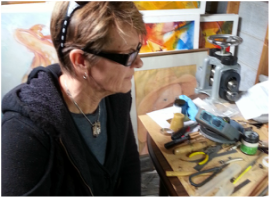 As well as being a lapidrist and silversmith, Dee is an accomplished sculptor and woodcarver and creates walking poles, acrylic paintings and pencil drawings along with sculptures from many different mediums. Dee incorporates many different techniques, including exploring texture, patina and form along with found objects and semi-precious stones. Many hours of work go into each piece, from design to fabrication. Dee has a studio at Rivertrack Studios, Wentworth, which is at the confluence of Australia's two longest rivers - the Murray and the Darling and is the gateway to the Australian Outback. The town has attracted many artisans, inspired by the raw beauty and wildlife of this unique region. In 2017 Dee won the sculpting section of the Outback Archies competition at Coonamble, and is currently preparing for a solo exhibition at Gallery Lane Cove, Sydney, in October 2018. Dee recently attended an intensive Marble Workshop with Alnassar, who lives and works in Carrara, Italy. The workshop was at the Tom Bass Sculpture School, and inspired Dee to explore a beautiful medium of marble and create works on a larger scale.